Do you live in Cardiff and have a bee problem? Look no further than D-Tek Live Bee Removal to solve all of your Cardiff bee removal needs. We specialize in the live and humane removal of honey bees. We use a specially designed vacuum system to gently remove the bees from the area they are located. After we have removed the bees live we drop them off to our beekeeping farm in San Diego. By choosing D-Tek Live Bee Removal to permanently solve your bee infestation in Cardiff you can be assured it will be taken care of properly the first time. All of the above-mentioned steps are very important, however, there are two that stand out above the rest. The complete removal of all beehive and honeycomb is one of them. Honey bees have an excellent sense of smell. If you leave any beehive or honeycomb in the structure you leave yourself at risk of having the honey bees return in the near future. Honey bees have an excellent sense of smell. If you leave any beehive or honey comb in the structure you leave yourself at risk of having the honey bees return in the near future. There is no shortage of bee removal companies in San Diego that will come and exterminate the honey bees with pesticides and leave the beehive and honeycomb in the structure. 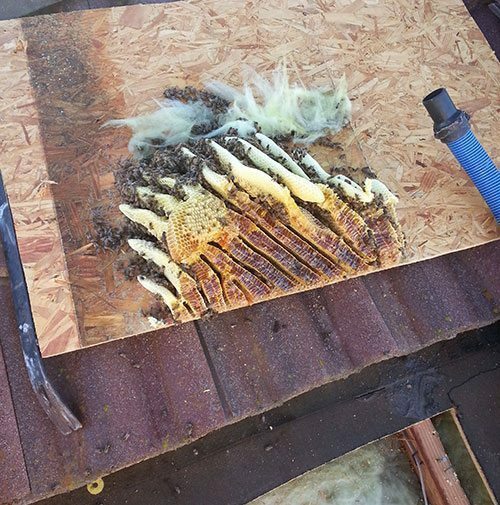 Another problem with performing a honey bee extermination is that after the honey bees are no longer alive to tend the hive all of the honey will melt out and can cause drywall damage, staining of the stucco, damage to electrical wiring, damage to wood framing, etc. It also puts you at risk for other household pests looking for a quick bite to eat. Ants, mice, rats, etc. Another critical portion of the bee removal process is the repair work. It is often times necessary for us to cut into the roof, stucco, or drywall to fully remove all of the bee hive and honey comb. Any roof or stucco repairs performed by D-Tek Live Bee Removal are guaranteed to be free of defects and to not leak. All drywall repairs performed by D-Tek Live Bee Removal and guaranteed to blend seamlessly with the surrounding area. D-Tek Live Bee Removal is fully insured. We also offer free bee removal inspections and estimates. We provide every customer a copy of our insurance at the time of the bee removal inspection and estimate. Once the bee removal has been completed and the bee removal repairs have been wrapped up it is time to bee proof the formerly infested area. We refer to this as bee control. One of our technicians will bee proof the entry and exit points of the area that was formerly infested as well as the area in a 10 foot radius around the bee hive entry and exit points. D-Tek Live Bee Removal also offers whole house bee proofing and bee control in Cardiff. One of our expert technicians will go over every crack, crevice, vent, and hole to make sure they are all sealed up tight. We guarantee all of our bee proofing and bee control services in Cardiff so if you do have a problem again we will take care of it free of charge. D-Tek now has our own beekeeping farm that we drop the honey bees off to after a bee removal in Cardiff has been completed. Our large apiary features over 45 hives that pollinate surrounding orchards and fields. We harvest raw honey, pollen, and beeswax from our hives. As a San Diego Beekeeper we adhere to best practices to ensure that our honeybees thrive in their colonies. We also offer hives for sale or beehives for rent for the backyard hobbyist or farmer looking for pollination services. Do you want your Cardiff bee swarm solved quickly? Give D-Tek Live Bee Removal a call today! The owner’s direct line is 760-224-3040. You can also email us and we will be in contact with you ASAP. If we do not answer the phone simply leave a detailed message with your contact info and we will call you back. In most cases we can have your bee removal in Cardiff taken care of within 24 hours of the first contact. Call today!